Summary: Grappling with writer’s block, legendary American poet Elizabeth Bishop (Miranda Otto) travels from New York City to Rio de Janeiro in the 1950s to visit her college friend, Mary (Tracy Middendorf). Hoping to find inspiration on Mary’s sprawling estate, Elizabeth winds up with much more – a tempestuous relationship with Mary’s bohemian partner, architect Lota de Macedo Soares (Glória Pires), that rocks the staid writer to her foundation. Alcoholism, geographical distance and a military coup come between the lovers, but their intimate connection spans decades and forever impacts the life and work of these two extraordinary artists. When a film begins to tell its audience that the film is about one of the most famous poets of all time but they aren’t a poet that you have ever heard of then you realise that there is something strange going on. Unfortunately for new film Reaching For The Moon that is just the start of this film going completely off the rails because this journey is going to be one that confuses both film and literature buffs alike. The film looks at poet Elizabeth Bishop (Miranda Otto) who decides to head away from New York for a bit during the 1950s and head to Brazil to visit her friend, Mary (Tracy Middendorf). What she certainly didn’t expect to find was that Mary would be dating a woman, Lota de Macedo Soares (Gloria Pires), and that soon she would be finding herself falling for that very woman. Reaching For The Moon is very quick to point out that Elizabeth Bishop is one of the most important poets to have ever graced this planet. That point is hammered into the audience a lot throughout the film and it’s obviously something that director Bruno Barreto felt that the modern day audience not only needed to know but certainly needed to remember. With that in mind it’s hard to then work out why Barreto has done such a bad job bringing just an important person in world history’s story to the big screen. 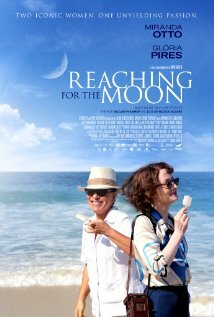 Technically though it’s not Barreto’s work that lets down Reaching For The Moon, no all the problems associated with this film come directly from the pens of the team of screenwriters that put this film together… and perhaps a fair bit from the editors. Ironically this is a film about one of the greatest writers of all time but it has one of the poorest screenplays you are ever likely to see this year. Actually it is probably the work of Barreto and his cinematographer that go some of the way to saving this film and at least making it watchable. When they haven’t gone about the lazy decision of using some fake scenery or a green screen there are some actually pretty attractive shot selections throughout this film, and often due to the poor script the audience is left feeling that it is only the visuals that are moving this story along. It is sad to see this tale of two strong women flounder so badly but really someone somewhere needed to alert the filmmakers to the fact that there really needed to be a script rewrite done somewhere along the lines. Here the script is bland and make the film end up becoming a real daytime movie style of film rather than the hard hitting character drama that this needed to be. Huge parts of Lota and Elizabeth’s lives seem to be just skimmed over. Moments of jealousy from Mary that should have been at the forefront of this film are treated like small events while the raging political environment around the pair in Brazil is written in such a way that it feels like it was written for fans of Days Of Our Lives. Sadly which some poor form from the screenplay by the time the film reaches the point where some of the characters lives are in the danger the film has petered out so badly that most audience members will have already lost interest in what should have been a gripping film. Sadly the script also holds back the performances of the cast as well. While Miranda Otto does get a chance to remind us that she can be a great actress and shouldn’t just be remembered for Lord Of The Rings her cast mates really do suffer. Gloria Pires and Tracy Middendorf are never given the grit in their roles that they deserved and as a result their performances barely raise a blip on the screen. Reaching For The Moon is a valuable reminder of just how about a script still is to a film. With the right screenwriters at the helm Reaching For The Moon could have been a powerful biopic so hard hitting that it warranted Oscar buzz, instead we are left with a film about two powerful women that really doesn’t do credit to their memory. Reaching For The Moon plods along like a television movie rather then ever reaching the heights it should. Other Subculture Entertainment Reviews of ‘Reaching For The Moon′: For our full Reaching For The Moon review please check The Good The Bad The Ugly Film Show Ep #88. You can also read Dave Griffiths’ Reaching For The Moon review on The Book The Film The T-Shirt.